I know right. Wonderful, wonderful surprising news, fo’ sho. Inasmuch as we were so in a mood for satay when we were invited to see the new Rumah Sate, it was one of those February days in Baguio where someone turned “our aircon” on full blast. (All right, who was it? *heehaha) Luckily, new varieties of laksa were just added to the menu (chicken and beef) that when beef was offered us, the idea of hot creamy spicy soup was sold without us hesitating even a second. While we waited for that comforting bowl of soupy noodles, we whetted our appetites with some fried spring rolls. I say, even if that was the only thing we had, we somehow felt so complete. Ground meat, strips of veg, and delicate sotanghon stuffed in rice wrap, taking a quick dunk into the tangy dip, Race wouldn’t let the fact go unsaid that he’s such a “lumpia” person and how these spring rolls were the bomb. Might be that when he nodded after every bite he took, he’s affirming in his mind: I ❤ rolls, I ❤ rolls. Then the lahksa arrived. What a sight to behold. Quick photos #bloggingeatsplorerduties, and we started spooning the warming broth into our gobs. *sip ahh The beef, looking so much like bacon, we were informed, is the very same type of beef we cook at Korean grill restaurants. A little bit of boiled egg there, some tofu, noodles, and mongo sprouts got our tastebuds singing and our bodies tingling with delight. Weee! We still had satay =b; cumi which means squid in Bahasa. Give me a moment while I relish in awe at how I’ve seen the sate plates of this Indonesian restaurant evolve. Amazing how a salad, with the beautiful colors of vegetables make a plate even more appetizing. On a banana leaf, together with rice shaped into a cone, some pickled chilis is enough to make even my eyes drool. And the squid, nicely grilled. *fingertip kiss This was the first to go bye bye in our sumptuous spread, as we finished off every one, from tentacle to tail. Looking for a little variety in cuisines for lunch or dinner? Not feeling Asian food at the moment? Not.A.Problem. 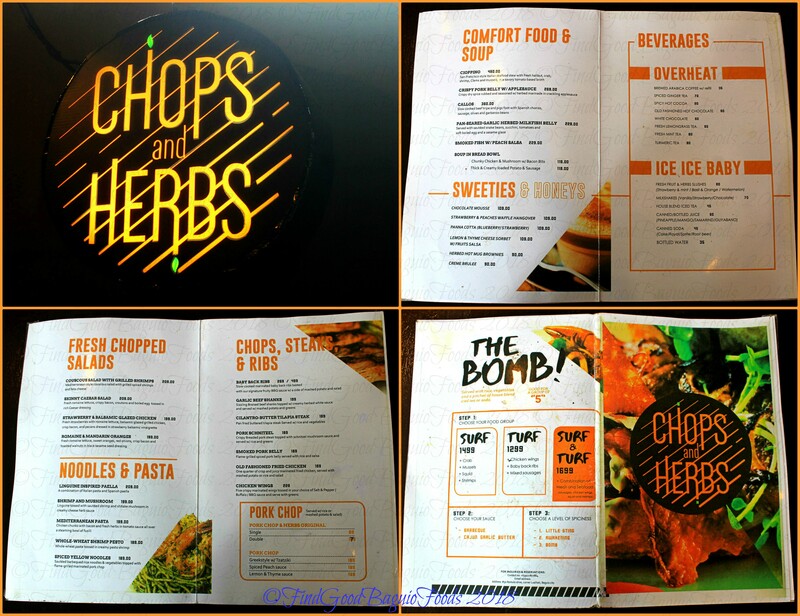 Steaks, ribs, pastas are just some of the dishes on the Chops & Herbs lineup. An unassuming plate, the garlic beef shanks was. Little did we know how it was going to make our eyes grow wide with wonder and astonishment. So we’re thinking, “Yeah, yeah, we’ve tasted creamy beef things before” and mah lawd, was this more than that. Tender beef (that’s a given *hihi) drenched in sauce that was more than creamy but also had body (like a mushy mashed potato). The shoestring potato topping was a texture game changer too. Underneath all that is the marrow I love so much (and a bone that my furry lovies undoubtedly took pleasure in *waggy tails for all at Rumah Sate/Chops&Herbs). Coming to the end of our meal, the send off for our taste buds was courtesy of cheesecake squares. Flavored as lemon grass and lime, and chili-mint, these really did pique our foodie curiosity. It seems that the main theme to our Rumah Sate/Chops and Herbs brunch was texture. =) What textures these desserts had! If ever we felt that the spoonful was getting boring, the coconut shavings livened things up again for this cheese cake. Similar how the citrus flavor in lemon grass and lime cheesecake was faint, the chili-mint was too. Pause and ‘namnam’ a bit to perceive that it’s there. Texture wise, again, the bits of chili and the peppermint crystals in the cheesecake were a fun surprise. It takes a food community with serious eats to offer to make a foodie happy, and this house, this house made us rrreal happy. Before we go, take a look-see at the section designated for Handle Bar. They start serving libations (like bugnay wine) at 5:00 p.m. But wait, there’s more. Coming soon is another resto from Ketchup, that we know and love: Rancho Norte. Look out for it on the second floor of this food community house. Enjoying the spread at the new food community. Wee! ***Thank you so much, Ms. Shane for giving us more than a sneak peek to Rumah Sate and the blooming food community in the house of satay. It sure was a pleasure to meet you and the matriarchs of your family. (Thank you, Auntie Linda.) Whoa, we almost got a bingo there, meeting someone from every generation. (Hope to meet you at our next visit, Ms. Chef Joy; thank you.) More power to you all! Bongga may bagong post ka na. Talaga lang new Rumah Sate locashen at food community ulit.ANg daming malalafang. Hello there, Mario! Remembered it’s a holiday weekend so habol post … Good timing, I do have a feature in line, the Rumah Sate returns and with friends, Chops and Herbs and Handle Bar. Definitely so many things to eat in one food community house. 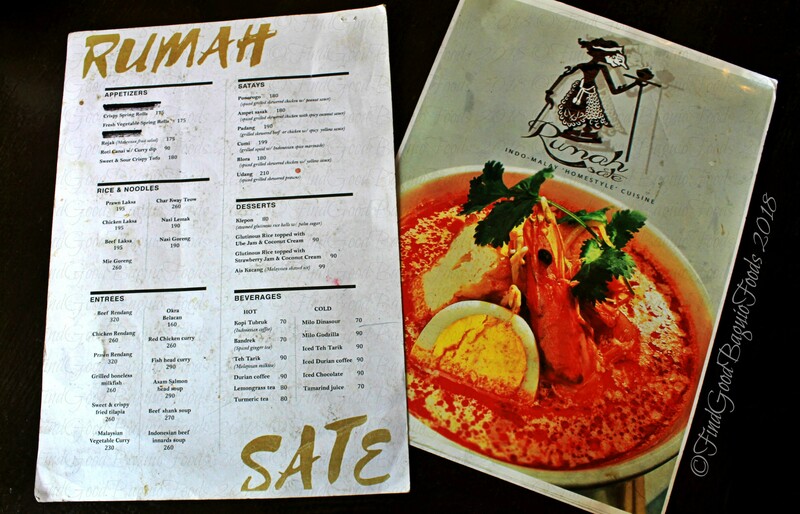 Is this new location of Rumah Sate where Chef’s Home was? Where did Chefs Home go? I also want to see the new Rumah Sate but I think I have to shelve it for awhile till Panagbenga fever is over. I can already see how much traffic there would be around Baguio. I’m very excited to try the new dishes in Rumah. Thanks again for your informative posts. Hello there, Steph! Oh right, weekend house arrest time for Baguio residents again. Happy Easter, Find Good Baguio Foods. A food community to replace Ketchup. Its good Rumah sate thought of bringing it back. I like that they also have something new in Chops and herbs. Thank you for this. Hello, Tess! I hope you had a great Easter and vacay! Yes, it really is fantastic that Rumah Sate is back and they’re back with a food community of sorts. Tnx for this post and the info that Rancho Norte is open. I hope you went up to see how it looks there. very nice ambiance. Hello there! Aw, we didn’t go up to see how it looked at the new Rancho Norte. Thanks for the heads up. Now, I’m excited to see!